A hammer drill, also called by the names “rotary hammer", "rotary-drill" or "hammering drill", is a rotating drill that generates percussion action. The percussion or hammering force produces a short and fast thrust that shatters breakable material and makes for faster drilling with little effort. Hammer drills are usually electrical tools, and more each day come out which are battery-powered. This is the same technology used for demolition hammers. They can drill through rough materials like brick or concrete, and are widely used by contractors; while there is little use for it around the house, some DIYers choose to have one handy, just in case. How hammer drills came to be invented is not very clear, but similar technology - which they have evolved from - has been around for over 100 years, with Bosch being one of the first companies to make one, when they introduced the ”Bosch-hammer” in 1932. Whether you're a professional contractor or simply into DIY, you may have projects where a hammer drill can result useful. If you’re in the market for one and can’t really decide what is the best hammer drill for your project, you’ve come to the right place. And if you're not in the market for one yet, we hope that the information that you will find here will have you change your mind. We will share reviews, talk about the uses of hammer drills, and what you should look for in one. Ready? Here we go. You only need to catch a glimpse of that trademark blue and black color scheme to know you’re looking at something special. 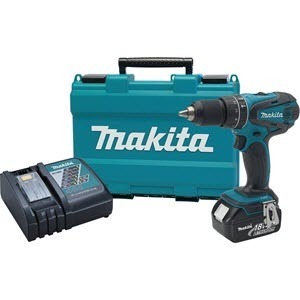 In this particular case, the Makita XPH102 18V LXT Lithium-Ion Cordless 1/2" Hammer Driver-Drill Kit certainly doesn’t disappoint! This absolutely gorgeous Hammer Drill is compact in size yet heavy in terms of speed and torque. 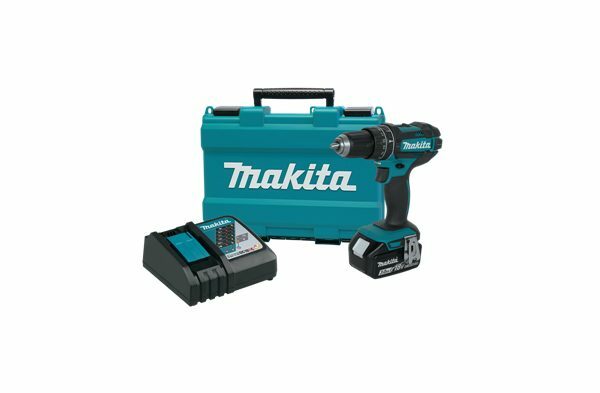 The Makita-built four-pole motor delivers 480 in.lbs. of Max Torque and up to 1,900 RPM and 28,500 BPM in the high-speed setting. What’s more, the company’s exclusive technology has been used to create a long-lasting battery that charges fully in an incredible 30 minutes. For maximum flexibility, the Makita XPH102 can be used as a hammer-drive drill or drill driver, making it perfect for multiple applications in professional and domestic settings alike. Incredible efficiency, superior power and fast charging times add up to more time spent on the job, less time sitting around waiting for it to charge! An unashamedly-premium power tool, with the kind of quality that more than justifies it’s relatively high price tag. Charges fully in just 30 minutes! Speaking of premium quality, absolutely everything about the DeWalt DW511 1/2" (13mm) 7.8 Amp VSR Hammer Drill simply exudes professionalism. Designed to tackle the kinds of jobs any lesser tool would be unable to cope with, the DeWalt DW511 is perfect for the vast majority of wood, steel or masonry applications, featuring a 360-degree side handle with depth rod, and two-finger rubber trigger. 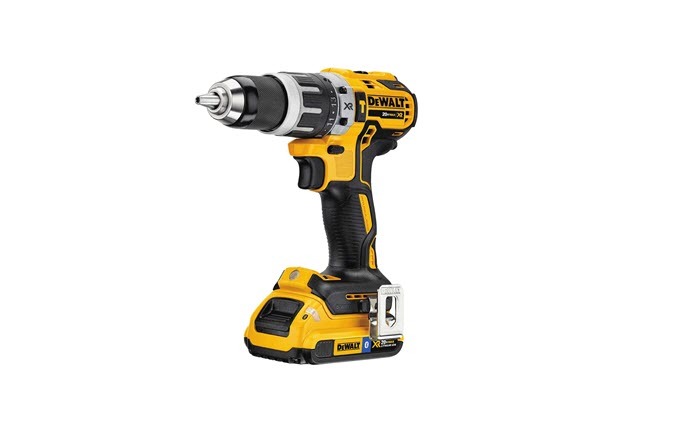 Boasting a powerful 7.8-amp motor with variable-speed control, the this DeWalt Hammer Drill is also incredibly comfortable to work with. This impressive piece of engineering offers a 1/2-inch drilling capacity when working with a variety of metals, along with a 1-1/4-inch capacity for wood, and an impressive 5/32- to 3/8-inch capacity when drilling concrete. Weighing approximately 4.3 pounds, it isn’t the lightest drill of its kind on the market, but nonetheless has a feeling of quality that’s impossible to ignore. For total peace of mind, the DW511 Hammer Drill comes complete with a 90-day money back guarantee, a one-year free service contract and a three-year limited warranty as standard. The kit includes the drill itself, along with a 360-degree side handle, depth rod and chuck key with holder. In short, if you’re looking for the kind of professional-grade power tool that both means business and is guaranteed to go the distance, the DeWalt DW511 Hammer Drill is the one you should buy. Bosch was one of the pioneers in the drill industry and continues to develop and improve with every new series. This is not just a drill; it’s a full kit complete with batteries, charger and case. Reviewers have expressed their undoubted satisfaction with this product. Suitable for drilling through a wide range of materials, from wood to brick and mortar, the ​Bosch HDB180-02 18-volt lithium-ion 3/8-inch cordless hammer drill​ is a heavy duty power tool with a compact body. This hammer drill by Bosch can deliver enough torque to drive most popular fasteners and drill bits. It features an 8" head length and the hammer by itself only weighs 3.2 Lbs, making it one of the most compact and lightweight designs available. It minimizes user fatigue while being able to drive 160 3" screws in one charge. The Soft-Grip wrapped housing make it fit comfortably in your hand. Designed for extensive run time, it keeps the user on the job, maximizing productivity. The Bosch HDB180-02 is a 2-speed drill, going from 0-500 to as many as 1,450 RPM on high-speed. It features technology which will help monitor battery life, ensuring efficient power distribution without disruption. Its trademark Electronic Motor Protection is meant to protect the motor when stagnant. Also features a keyless chuck with trademark Auto-Lock system, designed for quick bit changes with just one hand. It works with all Bosch 18-volt lithium-ion batteries, and this kit includes two 1.3 Ah Slimpack batteries which don’t add much weight. 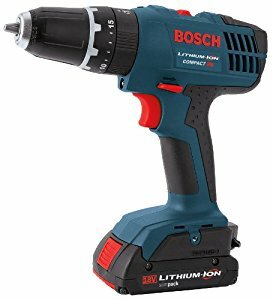 ​Bosch HDB180-02​ cordless hammer drill; two 18-volt lithium-ion Slim Pack batteries; one 45-minute charger; one double-sided Philips drive bit;one storage clip;one carrying case; one instructions manual. Chicago Pneumatic is a pneumatic power tool producer that has been around since before the year 1900. 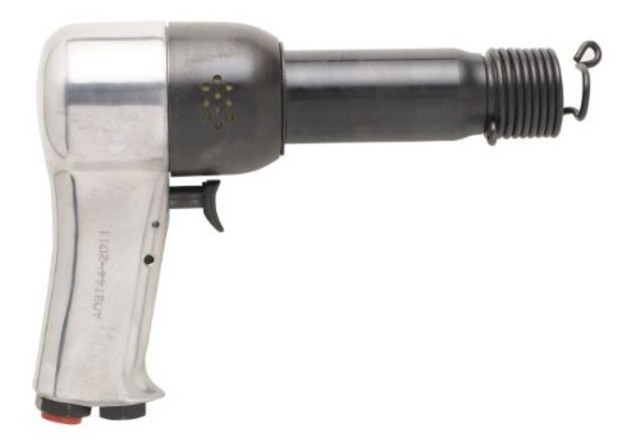 They manufacture an entire range of professional tools and we’ve chosen the ​CP717 Super Duty Air Hammer​ for this list due to its great performance during our test. Although it’s quite an investment, it is guaranteed to pay you back in performance! The fact that this is an air-powered tool means that it gets energy from the air, much like a jackhammer. It uses compressed air which goes in the hammer through a strong hose which is then transformed into energy used to drill or carve through stone, metal or wood. The CPT 717 features positive action trigger which ensures its precise control. With an impact maximum of 1,800 blows per minute. Can be used for various applications, amongst which you can do: kingpin removal, bulldozer walking beams, truck springs and heavy-duty spring bushings removal and installation. The CP717 is a Super Duty Air Hammer and is specifically designed for the maintenance of automotive, truck and off-road vehicles. It features a .498 large shank which is useful in heavy duty tasks. Heavy Duty users will fall in love with this powerful tool. Specifications: .498-Inch chisel shank opening, 3/4-Inch bore diameter, 2 11/16-Inch piston stroke length, 7 CFM , 1800 BPM. Dewalt is undisputably one of the biggest players in the power tool game. We could not miss the opportunity to include their hammer drill on our top picks list, since it worked perfectly on all counts during our test. Also, it’s a great value for the money. 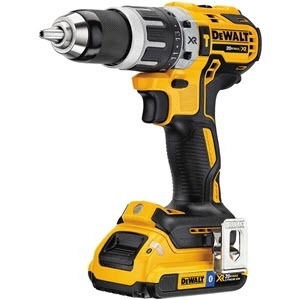 ​The DEWALT DCD796D2 20V MAX XR Li-Ion 1/2" Compact Hammer drill Kit​ features the special Dewalt brushless motor which helps increase productivity by offering up to 57% more run time when over brushed, while the XR Li-Ion batteries complete with fuel gauge offer up to 33% more capacity than traditional batteries. This hammer drill stands in the compact, lightweight category at 7.5" length and weighing 3.6 lb on its own, which makes it able to fit into tight areas. It also features high speed transmission and an adjustable 2-speed setting from low,0-550, to high speed, 0-2,000 RPM. It produces 30% faster application speeds than other similar tools, while the ergonomic comfort grip handle ensures balance and control. It has a metal 1/2" ratcheting chuck which allows high bit gripping strength. The DCD796D2 hammer drill has a 3-mode LED which lights up in dimly lit spaces - an improvement to older models, by up to 20 times brighter - the spotlight mode features a 20 minute shutoff function meant for extended productivity and efficiency in dark or enclosed spaces. The kit includes: DCD796 - 20V MAX XR Li-Ion Compact Hammer drill, two DCB203 - XR 2.0AH Battery Packs, a Charger, a Kit Box, a Belt Hook. 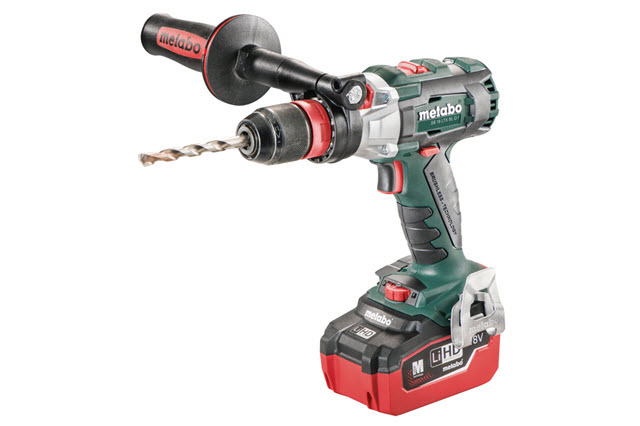 Metabo products are designed in Germany, and cover a full line of power tools designed for professional use. They strive to provide products with high levels of safety, reliability and performance. Metabo SB18LTX BL is one of the best hammer drills out there and that's why we have included it in our list. It comes at a reasonable price and in our opinion, this is the best hammer drill for the money. 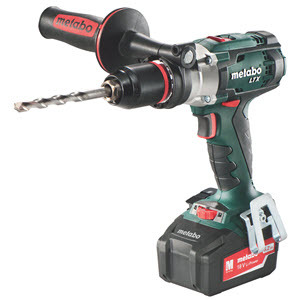 The ​Metabo SB18 LTX BL 5.2 Brushless hammer drill​ features Metabo's German built Brushless motor. It can reach up to 796 in./lbs. of torque and has a convenient two speed (0-600 and 0- 2050 RPM) setting, as well as it’s able to produce 38950 imp/min. This drill is strong and fast. Its customizable electronic clutch comes with no less than 11 different settings that are useful for a wide range of tasks, while it is quieter than standard clutch systems make it comfortable to use both for the user and others within range. It has a one of a kind mode switch at the top, which allows the user to easily activate or deactivate the torque selector wheel. The Metabo SB18LTX has an ergonomic design, it’s compact, yet unexpectedly powerful and can be used for demanding, heavy duty applications. Comes with: Two 5.2 Ah batteries, an ASC30-36 charger, a belt hook, a bit depot, a side handle and a carrying case. Milwaukee power tools have been around for over 85 years. Their continuous research and innovation brings us this hammer drill, which has received great feedback from users. 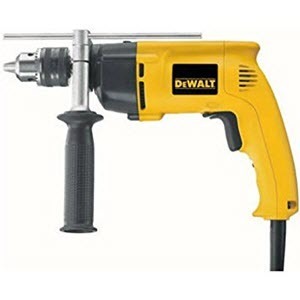 Only the best of the best for our readers - another top rated hammer drill. ​Milwaukee 1854-1 Drill with No. 3 Jacobs Taper​ features a powerful 10-amp motor, able to deliver 350 RPM, while the reverse torque offers 3/4” capacity in steel. Its heat-treated gears make for a durable, sturdy tool able to withstand difficult applications. It is helical-cut, which ensures quiet performance. The no. 3 Jacobs’s taper spindle comes in handy whenever you need to secure the hammer. Comes with an 8-ft. fixed rubber cord, pipe handle and instructions manual. Thank you for going through the reviews for the best hammer drills. We have provided these reviews of hammer drills based on our experience. We also want to help you figure out which is the best hammer drill for you as sometimes they might not have made so much sense to you if you didn't have any prior knowledge on the subject. In order to make it easier for you to decide the best hammer drill, please continue reading as we will explore the different types of hammer drills along with their uses and things to check for buying one. There are two main categories under which a hammer drill can be classified, depending on the mechanism that powers them. These categories are Cam-Action and Electro-Pneumatic. Hammer drills with lower power usually rely on a “percussion" or "cam-action” hammering mechanism. This can be described as two sets of gears, with teeth on them, interacting with each other; they produce a hammering action/ force which is transferred and rotates the drill bit. A particularity of “cam-action" drills is that the chuck and bit move both ways- forth and back while rotating, thus making the motion dependent on the rotation of the chuck. This type of drill can be used both with and without the hammer action, but never the other way around, as without the rotation over the "cams”, the hammer motion would be impossible. The drills in this category tend to be more compact and many are cordless. They are best used for occasional drilling in concrete or masonry, and not as much for production construction drilling. The units in this category are larger and they are more commonly called rotary hammers. They are usually not as compact, but are able to produce a bigger impact force, thanks to the electro-pneumatic (EP) hammering mechanism technology. This is owed to the fact that it is powered directly by electricity, while it also means that you need a reliable power source like an outlet nearby. An EP hammer relies on the action of two pistons—a drive piston and a flying one. The drive piston is moved back and forth in a cylinder by an electric motor turning a crank. At the other end of the same cylinder, there’s the flying piston. While the two pistons never touch, the air pressure in the cylinder easily transfers the hammering energy, faster than springs in the cam-action hammer drill. Most hammers rely on EP technology. Most drills today have separate functions for the hammer and rotation, allowing them to be used separately or together: hammer mode and drill mode, or combined. The hammer mode provides a drilling function similar to a jackhammer. 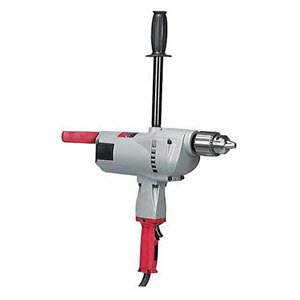 Both hammer drill types can be used for drilling holes in masonry, stone, or wood. They are also both used to in making holes in concrete footings for pinning concrete wall forms or framing. Large rotary hammers are also useful for doweling and making through-holes in concrete and masonry walls. 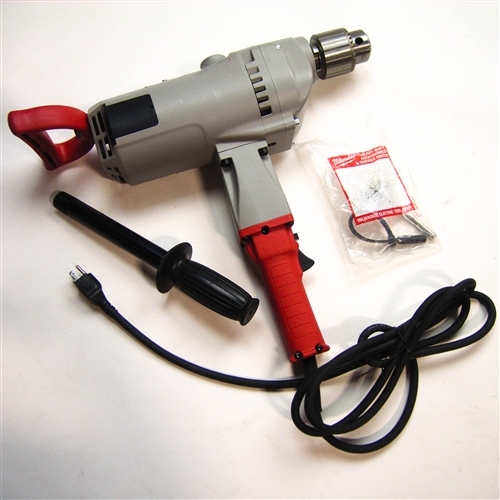 Both cam-action and electro-pneumatic hammer drills can be corded or cordless (battery powered), although usually the former tend to rely on batteries more than the latter. Now that we have seen what types there are, let's see how hammer drills can be used and what it is best used for. First off, let’s see what they can be used for. The specially designed clutch on a hammer drill is what allows it to not only spin the drill bit, but also to punch it in and out along its own axis. The bit moves back and forth a very small distance, and the blowing force is also small, while the hammering action is very fast; thousands of BPM (blows per minute) or IPM (impacts per minute) are achieved. Despite the low force of each individual blow, the fact that it happens thousands of times each minute - the speed is what makes it strong enough to break up concrete or brick. You can use the carbide wedge on the masonry drill bit to smash and make it easy for the spiral flutes to sweep up. This is what makes a hammer drill considerably faster than a traditional drill when having to go through concrete or brick. Usually, its anchor bolts that require holes in very tough materials; the same as wall plugs and concrete screws. The best hammer drills usually feature switches for locking off the hammer clutch, thus turning the tool into a standard drill for wood, metal, and other softer materials. You should know that hammer drills usually cost more and are more massive than standard drills, but they are preferred when you don’t know what is the material to be drilled. 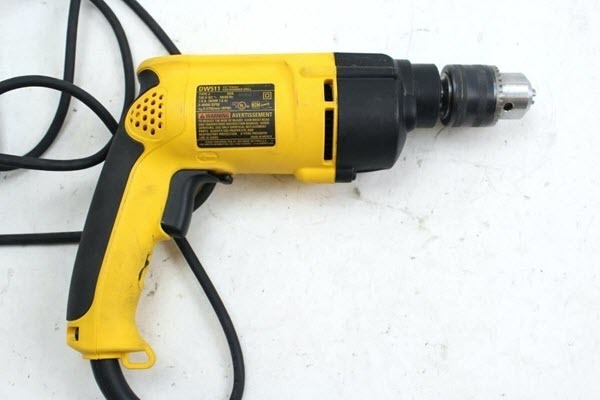 For instance, an electrician will use a hammer drill when attaching items like an electrical box, to either wood studs or masonry walls - for the first he could use a regular drill, and for the second a hammer drill; but the hammer drill can handle both scenarios, while the other couldn’t. Hammer drills are usually used by professionals and contractors when installing electrical boxes or other equipment to either brick or block walls. Nonetheless, DIYers and also use hammer drills in their various projects, especially when installing shelves or cabinets onto masonry. Standard drills cannot generate the hammering force required to break through aggregate. This is why it can be a tough task to drill a hole with one. This is where the hammer drill comes in handy. 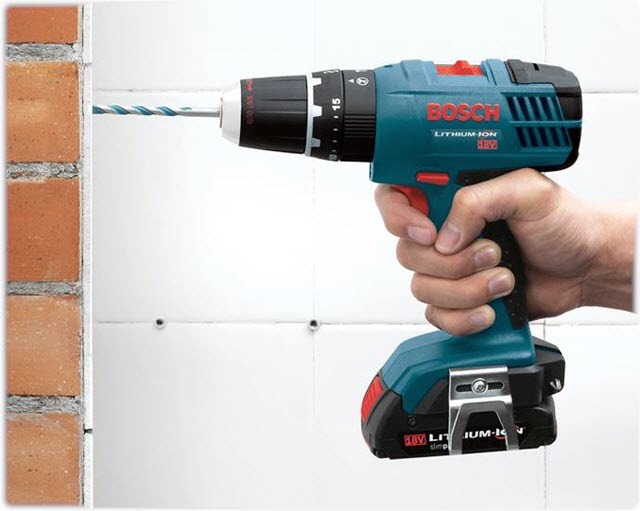 It is safer and more efficient to use a masonry bit on a hammer drill in order to drill a hole into brick. Hammer drills are specifically designed to do this, and are very efficient at boring holes through concrete cinder blocks or bricks. They do this by working two separate actions: hammering breaks aggregate, while drilling removes debris. You can make holes up to half an inch in diameter using the standard hammer drill with a masonry bit. For holes larger than that, or in order to make multiple holes, a rotary hammer drill may be required. The rotary kind can work in hammer only mode, which is great when you need to break through aggregate. The appropriate size masonry bit is very important when you need to drill a hole through brick. This is why you should get bits in the correct size, but it is as important to choose a bit that is suitable for a hammer drill. Usually, masonry bits are pretty generic and can be used both in standard and hammer drills. In order to drill a hole through concrete or brick, you must keep the drill well aligned with the angle you want the hole to have. You need to hold the drill with a tight grip in order to prevent it from wavering in your hand. Otherwise, you risk the hole to be incorrect or shallow. Then, apply pressure to the drill while still letting it do all of the work. Be careful not to put too much pressure or the bit might bend or break. It is important that you pull out the bit from the hole every so often while drilling in order to remove debris. We can never stress enough how important it is to use your tools safely. Please remember that these can cause severe injuries to yourself and anyone within range. Use extreme caution and wear protective goggles every time. Be sure to replace the bits as soon as they become bent or you can see that they are worn out. You may also want to check out a dust mask and maybe some noise cancelling headphones. Now that we've gone through some reviews and that we have seen what a hammer drill is good for and how to use one, let's check out a couple of important factors that you need to take into consideration when choosing the best hammer drill for your projects. How much power do you need? If the answer was “a lot”, then go for the higher voltage when choosing your hammer drill. The higher the voltage, the more power the drill will have. The amount of force you need depends on the nature of your project and on the density of the material that you will be drilling into. This means that for concrete drilling you will need more power than you would for wood studs. By this consideration, the most powerful entry on our list is number 5, the ​DEWALT DCD796D2​. When choosing a hammer drill, you should look out for the twisting power or the amount of usable output that the tool can provide. Twisting power is what makes the torque. The best hammer drills have adjustable torque settings that allow you to drill into tough materials as well as softer ones by just changing the settings. This helps prevent drilling too quickly into the softer materials and causing damage as well as the inability to go through the material thoroughly. If this is important to you, you may want to consider getting one of the tools which have this option. Hammer action or hammering force is what makes drilling into masonry or brick easy, and it is measured in beats per minute or BPM. So, if your project includes drilling into such materials then you should keep an eye out for the value of this factor. The speed of the hammer drill is measured in rotations per minute or RPM. The best tools out there have adjustable settings when it comes to speed, offering you a better control over it. Depending on the size of the hole or the type of the bit that you are using, you might want to be able to adjust the speed of your drill. Check out entry number 8 on our list above, the ​Milwaukee 1854-1​. If to be productive is what you want, as well as being able to work from anywhere and require portability, then you should pay attention to the charge time of the hammer drill. Some charge faster, while others may take a while. This is a common sense thing - the quicker your battery charges, the faster you'll be able to complete your project. For example, entry number 3 on our list, ​Bosch HDB180-02​, has a 45-minute charge time. If you do choose portability, then pay attention to the number of batteries that the drill needs and what type they are. The amp/ hour rating is what describes the storage capacity that the battery has. For instance, a 1.5 Ah means that the battery is supposed to last for 1.5 hours before it runs out of battery and requires a recharge. It also means that it has a larger capacity than a 1.2 battery. So, it makes sense that depending on the nature of your project and how many hours you plan on spending on it every day, you choose a higher amperage per hour - or maybe your needs can be met by a lower amperage per hour. The number of batteries is also important, mostly because some tools out there don’t come with batteries at all by default. You will need to purchase a suitable battery individually. The chuck is that part of the drill that holds the drill bit. For better bit retention, look for keyless chucks; they also live easy bus changes. The most common is a 13 millimeter check which is suitable foremost drilling task and it can adjust to hold any drill bit that is up to 13 millimeters in diameter. Check out the ​Bosch HDB180-02​, number 3 on the list above. Most drill available on the market feature a 2 speed gearbox, which allows the increase of torque while working on a low speed setting. This means that high performance can be achieved even at a low speed. If you're planning to drill through delicate materials like glass, tile, wood or soft metals, low speed settings will be most suitable because they do not pose the risk of damaging the material. Finally, we hope that the information presented here has been useful to you. However, please go on and look for information wherever you can find it before making the decision. It is very important that your decision to be well-informed in order for you to be fully satisfied with it. Remember to always think about safety and consider accessories to that end. Take your time and do not make a hasty decision, and may your project turn out exactly how you plan. As usual, we wish you the best of luck.